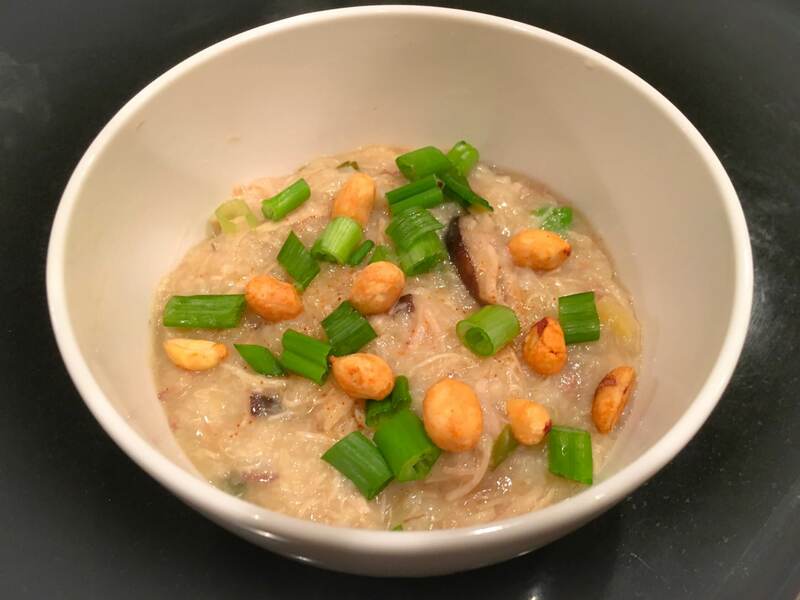 This is a very easy to make simple recipe for Instant Pot Chicken Congee. I made this as an Instant Pot experiment and it was an instant hit with my family. It’s perfect to make during the winter time. I have many memories of my Mom making jook growing up and I am happy to share this with you. 1. Mince all of the ginger. Crush and mince all of the garlic cloves. Mince all of the green onion. Set aside 1/3 of the green onion to put in the Instant Pot and 2/3 for topping. Save the roots of the green onion. (You can put them in a cup of water and they will grow.) Slice the shittake mushrooms. 2. Wash the rice under cold water. Rinse until the water runs clear. Place the uncooked rice at the bottom of the Instant Pot and add all of minced garlic, all of the minced ginger, and 1/3 of the green onion. Sprinkle each item evenly on the bottom. Top the green onion with the sliced shitake mushrooms. 3. Layer the chicken thighs, with bones still attached but skins and fat removed, on top of the rice, green onion, ginger, and garlic. Add the 2 boxes of chicken broth or 8 cups of chicken broth. 4. Make sure the steam release valve is in the ‘’Sealing’’ position. Press the ‘’Porridge’’ button to begin cooking. Do not make any changes to the pressure. Once the pot heats to the required temperature, the display will begin to count down from 20 minutes. 5. After 20 minutes, you will see the pot switch to the ‘’Keep Warm’’ setting. Allow the pot to reduce in pressure naturally and do not open the steam release valve. When pressure goes to low keep waiting. You will see LO and the number of minutes it is LO. When the display says “LO 20” (meaning you wait 20 minutes after it goes to low) open the steam valve and allow it to release the pressure. Carefully and slowly open the lid. 6. Use tongs to remove the chicken pieces and bones. The meat should be sliding off the bones. Use a fork and knife to shred the meat and debone it. Make sure to take out the chewy white things on the ends of the chicken thighs bones. Return the chicken meat to the pot and stir it in. 7. Stir the porridge very well. Add a little bit of salt, pepper, and soy sauce or Maggi sauce to taste. Do not over season or over salt so that each person can season or salt their porridge to their own liking. Less is more. I usually add maybe a teaspoon of soy sauce to the whole pot and salt and pepper very, very lightly. Everyone will season their own bowl so don’t over do it. 8. It’s a good idea to have each person taste the congee before adding any toppings to avoid over salting or over seasoning. The congee is already pretty flavorful. Have the ½ cup peanuts, 2/3 of the minced green onion, soy sauce or Maggi sauce ready. Serve bowls of the congee (gai jook) and allow each person to top their bowl with their desired toppings. Enjoy! *This recipe can be made with boneless skinless chicken thighs as well but it is definitely more flavorful when made with chicken thighs with the bone in and skins removed. *6 drumsticks or even a whole chicken can be substituted for the 6 chicken thighs. Just be sure to remove the skins.